Poem based on a photograph by Sebastião Salgado, in which a one-legged-man on crutches walks down a street in Kabul, Afghanistan. 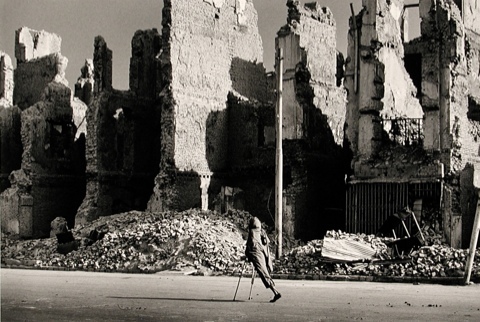 The buildings on the avenue have been completely destroyed, after a number of bombings that the city has endured. the frames of broken buildings – the ruins of his town. These recent ruins do not excite archaeologists. They are debris of the war, not the erosion of time. The eyes that examine them have no need to invent a past. A past era lives on and on in the restless memory of the living. This civilisation was not lost. With fear, it peeps out, like grass between stones. when real rivers will reflect new buildings. A man travels a road like a river in its bed. They are no mere reflections, the ruins in his flesh.